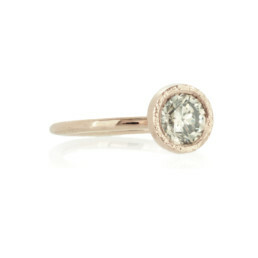 A solitaire engagement ring with a 1.01ct light champagne diamond set in Fairtrade Gold. The stone setting is in 18k rose gold with a micro-hammered finish around the bezel. The band is a gently tapered halo-style shank in hand-alloyed 18k rose gold to compliment the pink hues of the diamond.